This S.A.V.E. 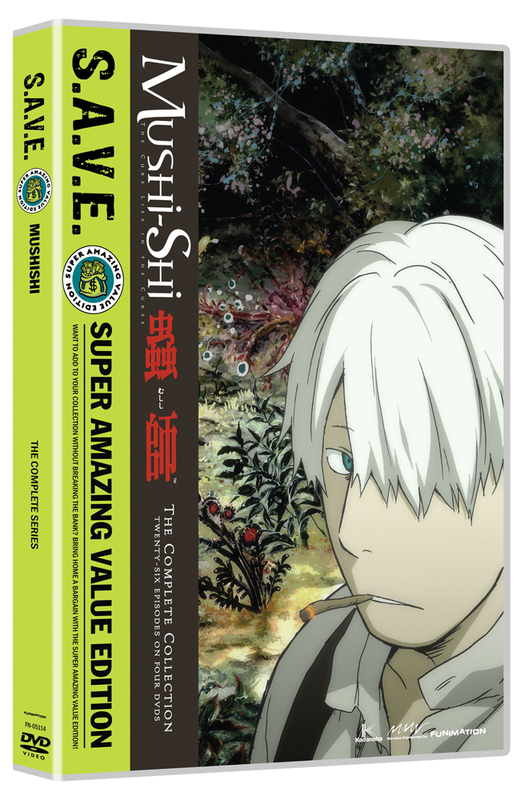 edition Mushi-shi Complete Collection contains episodes 1-26. Between this world and the next, there is a point where it becomes impossible to distinguish between plant and animal; between life and death. It is a place man was never meant to tread... It is where you will find the mushi. Neither good nor evil, they are life in its purest form. An unseen river reshaping the path of man, through their very presence we are changed. Vulgar and strange, they have inspired fear in humans since the dawn of time and have, over the ages, come to be known as "mushi." Special Features: Interview with the Director, Actor/Director Commentary, Production Studio Tour, Mushi-Shi Manga Pages, Textless Opening Song, Original TV Spots, Trailers. Travel across the land with Ginko. In the anime Mushi-shi, literally meaning 'spirit or mushi hunter or mushi master', we meet Ginko and he is one of these Mushi-shi a 'Mushi Master'. He wanders the lands in search of these strange creatures called the Mushi. As Ginko travels the across lands he studies the Mushi and teaches those he encounters how to live in harmony with these mysterious spirits. Their existence and appearance are unknown to many and only a limited number of humans are aware they even exist. Sometimes these Mushi are completely harmless to all, but in some cases they are very dangerous, if not deadly, to deal with. As Ginko says in not so many words in one episode, they are like a bothersome neighbor that you have to put up with and can't really do anything about it. You have to find the balance and go on with your life and accept the fact that they are real and you must deal with that fact. The Mushi are more primitive than animal, plant or bacteria, yet they are closer to any source of life we as humans know. They are at the heart of all life, a living river of lifeforce. Ginko journeys through a world that resembles medieval Japan. The series is episodic in nature and there are a few recurring characters besides Ginko as he returns to those he's helped from time to time. His payment for his services? Just a few Mushi related items, strange and sometimes dangerous objects. As we see in one episode about a beautifully crafted inkstone. Speaking of beautiful, the artwork and animation by Artland is phenomenal. The backgrounds in Mushi-shi look real at times, like you could jump right in and join Ginko. I do envy Ginko, what an amazing life he leads. As the story goes on from one town and person dealing with a Mushi problem to the next etc, you find yourself wondering about Ginko as well. How did he get his unusual white hair and green eye color? Why can he not stay in one place for very long? As the answers come, you'll be delighted by this wonderful and gorgeous anime. Of course alot of you know about this anime. However, if you are one of those on the fence about purchasing Mushi-shi. By all means please jump right in, but don't stare at the river of light for to long. The series is 26 episodes long and is licensed by FUNimation in the U.S. There are several boxsets available, and the singles are still floating around out there too. It's an instant classic, and even though it's episodic, I think it's also a great 'gateway' anime. Something to enjoy with your friends and family alike. So, journey across the land with Ginko and discover with him the epic beauty of the Mushi and experience first hand the danger of being a Mushi-shi. If you like fantasy, adventure, and mystery, you will love this anime. All episodes are animated beautifully, sound wonderful, and have a very intricate story. The S.A.V.E edition has a lot in each disc and is available for an affordable price. You will not be sorry you bought Mushi-Shi!!! This is the first DVD I've purchased (and probably the last) without watching the whole series first. I was pulled in by the raving reviews, and after watching a few episodes on Hulu, I knew I had to own it. It was such an easy decision to make due in part to it's episodic format, in which each episode tells it's own story but are slowly weaved together as we follow Ginko's journeys; the other reason for my quick purchase is because it simply gave me a feeling unlike any anime had before, or any other media for that matter. Each episode lulls you into such a calming state, with it's contrasting light and dark imagery and haunting soundtrack that makes you feel like you've truly entered a distant and mysterious world. Mushi-shi is such a stand-out anime, and something everyone should experience. Just recalling it enough to write this gives me chills and. I'm so glad to own it and can't recommend it enough. Mushishi is one of the best anime out there. The way each episode is a complete story filled with strong, impactful events leaves the viewer satisfied with every episode. Great to own this unique classic for such a cheap price. No excuses, just pick it up. I enjoyed this series and it's a nice break from more loud and action packed anime. If you like mysteries and strange happenings, you'll love Mushi-Shi. I give this series a 7/10 for the strange and unusual in the world. Most of what I'd say has already been said, so let me add that one of the wonderful elements of Mushi-shi is a unique animistic mythology, a pleasant relief from predictable yokai, oni, ect. This makes the resolution of each story suspenseful because the mushi aren't evil or good, they just ARE.